We can thank beautiful bovines for many things: cream for our coffee, butter for our toast, and cheese for our pizzas. Perhaps that’s why they have also been the star subjects of a tradition dating back more than a century. 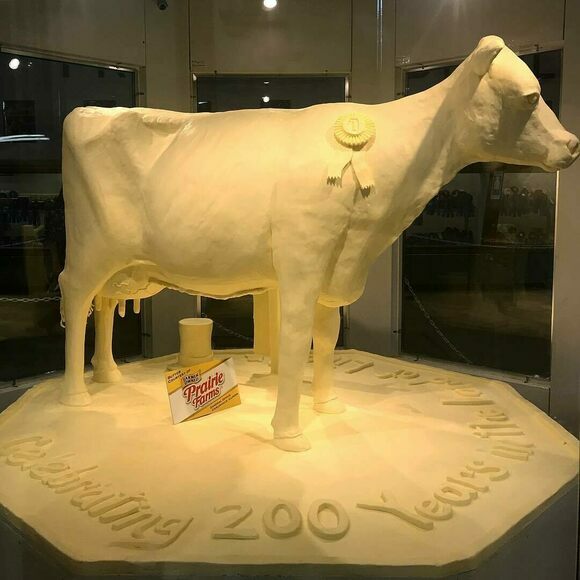 Butter cows, life-size sculptures made out of butter, are still main attractions at state fairs across the Midwestern United States. At the beginning of the 20th century, butter was making its way from cottage to cooperative industry. New creameries and dairy councils needed an alluring way to advertise their product. Meanwhile, the refrigeration industry also needed an eye-capturing way to expose the masses to their innovations. Butter cows were a funny yet useful conceit: As one writer puts it, “To make the cow from the product for which it produces the raw material is a clever reversal that brings irony and amusement to the viewer’s contemplation of the sculpture.” Moreover, as the industry grew ever more mechanized and scientific, butter cows harkened to a simple past of milkmaids, barefoot boys, and their bovine charges being merrily milked in a bucolic wonderland. Butter cows usually weigh in at around 600 pounds, about half as much as their living counterparts. Artists apply low-moisture butter to a wood, metal, wire, and steel mesh frame, and carve in a 40-degree refrigerated room over the course of several days. Each year a new butter cow takes center stage at state fairs, usually made using the butter from last year’s sculpture. According to the artists, the butter gets better the more it’s worked, and one sculpture’s butter can be reused for up to 10 years. In other words, mooo-ve over, nine-lived cats, this cow’s reincarnation has you beat. In addition to cows, the fair has featured butter-based sculptures of everything from Darth Vader to John Glenn. Come for the butter cow, stay for the dog show. A distinctive herb named after a First Lady. Each year, one talented artist puts on a show sculpting twelve butter-based busts of dairy princesses.